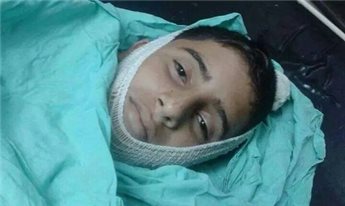 In the central West Bank village of Beit Laqiya, this Friday, thousands of people attended the funeral of 13-year-old Bahaa Samir Badir, who was shot dead by Israeli soldiers on Thursday. Further restrictions imposed on al-Aqsa Mosque have forced thousands of people into the streets of occupied East Jerusalem for Friday prayer. The funeral procession began at the Palestine Medical Complex, following Friday prayers, in nearby Ramallah, heading towards the al-Shuhada cemetery, where the boy’s body was buried. Ma’an News Agency reports that mourners waved Palestinian flags and carried pictures of Bahaa as they shouted slogans demanding an end to the murder of Palestinian children and that Israel be held accountable for its ongoing crimes. Medical sources confirmed that the boy was shot in the chest after Israeli forces raided the village of Beit Laqiya, on Thursday evening. An Israeli military spokeswoman said that Israeli forces shot at a crowd in the village, but that Palestinians had hurled Molotov cocktails at the troops. Bahaa’s death now brings the total number of Palestinians killed by Israeli forces in the occupied West Bank this year to 42, so far, in addition to the nearly 2,200 Palestinians slain during Israel’s summer offensive across Gaza, approximately a quarter of whom were children. In Jerusalem’s Old City neighborhood, thousands of Palestinians performed prayers in the streets and alleyways, on Friday, after men under the age of 50 were prevented by Israeli authorities from entering the al-Aqsa Mosque compound, Ma’an further reports. Hundreds of Israeli border guards, police, and special forces were deployed throughout the city streets. At least one drone was reported in addition to a surveillance balloon, as authorities prevented worshipers from reaching the holy site. 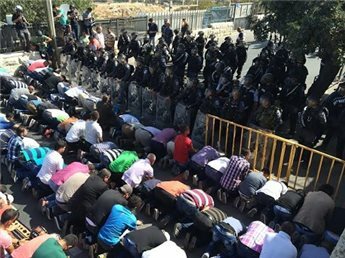 Crowds of people performed prayers in the streets of numerous Palestinian neighborhoods which lead out from the Old City including Ras al-Amud, Wadi al-Jouz, Salah al-Din, and al-Musrara. Two Palestinians in the Damascus Gate area were detained after being assaulted by Israeli police, member of the Arab Palestinian Front office Said Shweiki told Ma’an. He identified the detainees as Marwan Majed Shweiki, 22, and Muhammad Nasser Shweiki, also 22. Meanwhile, in the neighborhood of Ras al-Amud, Israeli forces fired stun grenades at worshipers as they finished prayers, in an attempt to disperse them, while Palestinians responded by throwing rocks at soldiers. Israeli forces deployed heavily in the alleyways of the neighborhood of Wadi al-Jouz, where Palestinian youth threw rocks and fireworks at soldiers. Clashes were also reported to have eerupted in the al-Issawiya neighborhood, near the Hebrew University, in occupied East Jerusalem. Around 3,000 worshipers were able to perform Friday prayers inside the mosque as a result of the Israeli restrictions, according to Ma’an, but the overwhelming majority were elderly men and women. According to witnesses, Israeli forces assaulted young worshipers as they attempted to enter the Old City, via the Damascus Gate, for early Friday prayers and, as a result, dozens of Palestinians were forced to pray at the gates surrounding the compound. 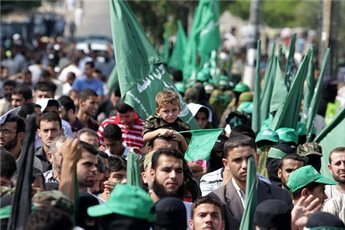 In Gaza, on Friday, Hamas organized a march to call attention to the continued threats to the mosque. Senior Hamas leader Ismail Radwan addressed the crowds, saying that a ‘dangerous level of Judaization’ is taking place in Jerusalem and that Israel plans to demolish al-Aqsa Mosque. ‘Al-Aqsa is a red line: Israel must be aware that the ongoing raids and attacks on al-Aqsa will cause a volcanic explosion in the area that will reach Israel,’ he said. The political leader also called on the PA to stop its continued security coordination with Israel and to act on Israeli attacks on the holy site. On Thursday, Hamas chief-in-exile Khaled Mashal also called on Palestinians to defend al-Aqsa. Similar marches were held across the occupied West Bank, on Friday, only to be suppressed by PA security forces.